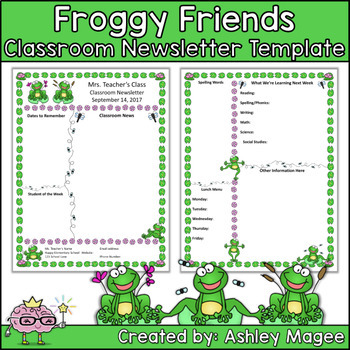 This is a two page classroom newsletter template with a Froggy Friends theme. The file is to be opened in Microsoft PowerPoint. 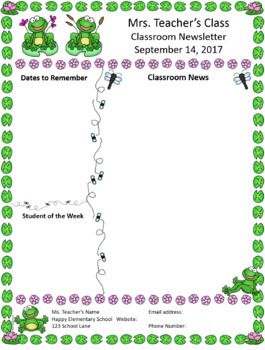 Also included is a blank page with only the border - no other graphics - that can be used for creating matching letters to send home with students. You will print this file from PowerPoint. It looks great in both color and black and white to save on ink. Directions and Tips for Editing and Printing are included. Please do read them! Looking for a different theme? 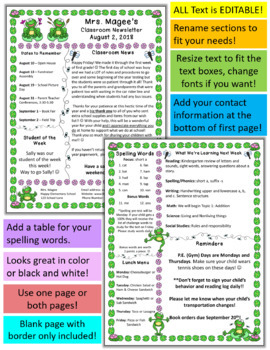 I have many other newsletter templates available in my store. Be the first to know what's new in my store: Look for the green star next to my store logo and click it to become a follower. Hooray and Thanks! You will now receive updates when I post new items! Go to My Purchases page on TPT. Beside each purchase, you'll see a Provide Feedback button. Simply click it and you will be taken to a page where you can give a quick rating and leave a short comment about this product. Please, do not leave questions in your feedback as I may not see them in a timely manner. Remember, if you need help with a resource, please contact me before leaving feedback so I can assist you. Also, when you leave feedback on your purchases, you will earn credits that can be applied to save money on future purchases. This product is licensed for personal use in one classroom only. 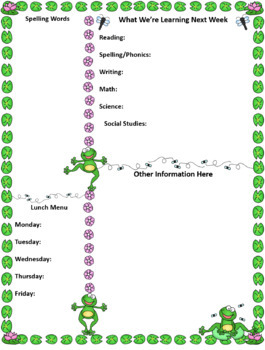 For use in multiple classrooms, additional licenses are available for purchase at a discount.